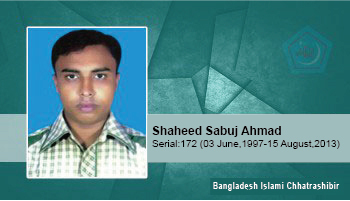 On June 24, 2013, at the end of the organizational work in Padua, while returning home after praying Salatul Maghrib in the Padua Bazaar mosque, the Chhatra League and Jubo League terrorists kidnapped him and took him to Alam's house in Kulasar village. He was physically tortured there. He was severely attacked with rods and sticks, and thrown to the roadside. The police arrested him, took him to the police station, and tortured him. After seeing his critical situation, he was admitted to Chouddogram Hospital and his family was informed. He attained martyrdom at Miyabazar, while on his way to be admitted to Comilla Medical College for his critical condition.